On Sunday, 262,135 registered voters in the Maldives will cast ballots to elect the country's president. 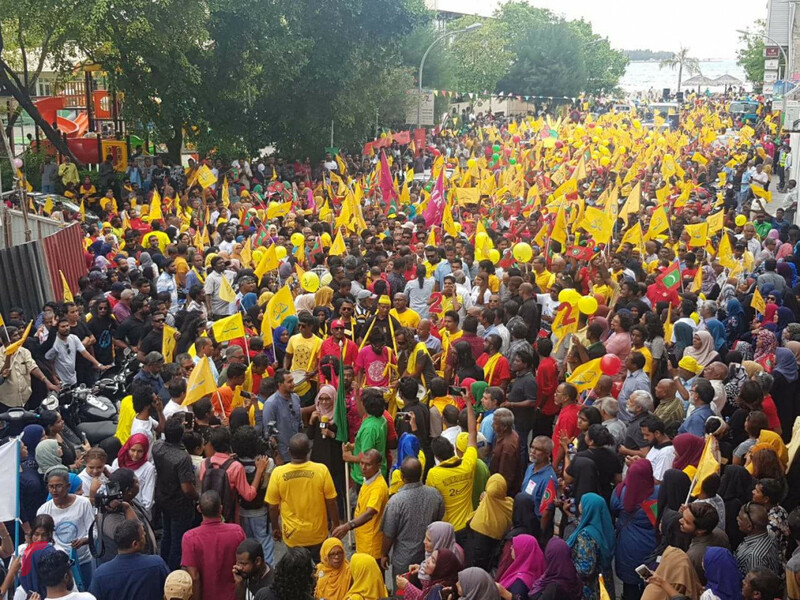 Follow RaajjeMV's live blog as we bring you the latest events as they unfold. 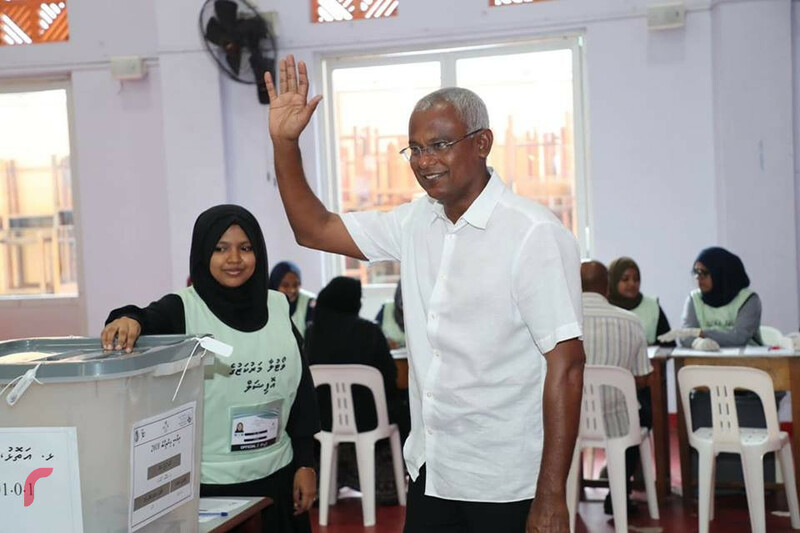 Joint opposition coalition's Presidential candidate, Ibrahim Mohamed Solih has won the preliminary results of the Presidential Election of 2018. Officials at Thinadhoo begin counting a ballot box, the result of which has been questioned in Thinadhoo island of Gaaf Dhaalu atoll. Supervisor of the ballot box requested the complaint to be filed at the complaints bureau. Elections Commission spokesperson said that they gave permission for Faresmaathodaa MP Hussain Mohamed Latheef to vote since he had submitted an application to register to vote in Male' but it was not confirmed due to an administrative issue. Vote counting has begun in some polling stations. Abdul Raheem Abdulla, the deputy leader of the ruling party, has congratulated President Abdulla Yameen before the votes have been counted. Faresmaathodaa MP Hussain Mohamed Latheef receives 'special permission' from the Elections Commission to cast his vote even though his name is not in the voters list. Voting ends in Maldives, however voters who were already in queue at 7pm can complete the voting process. Elections officials have begun sealing the ballot boxes at polling stations where there are no queues. EC spokesperson Ahmed Akram says that voting will not be extended any further. According to the Department of National Registration (DNR)'s Director Fathimath Fareedha, it had issued a number of national identity cards during the weekend as well as election day (which was made a public holiday). Voting continues in London, UK. 90% of eligible voters have cast their votes for the Presidential Election, and there are little to no people in most queues. While the EC had earlier declared that polling is to continue til 7pm, almost 90% of eligible voters have already cast their votes in outlying islands. As such, there are little to no people lined up outside polling stations in Eydhafushi island of Baa atoll, as well as most outlying atolls. The capital city, however, still has lengthy queues outside polling stations. Some of the queues stretch further than the eye can see in the capital city. With less than 30 minutes for the poll to conclude, Elections Commission has announced that voters will be allowed to queue outside polling stations until 7pm. With this decision, voters will be allowed to join their respective queues before 7pm, and voting will continue until everyone who joined the queue has cast their votes. Polling was initially scheduled to end at 4pm. While this decision has been reached, residents are still waiting in long queues, some since morning. Reports have also surfaced that some are blacking out due to having to stand long hours under the scorching sun. Member of Parliament for South-Thinadhoo constituency Abdulla Ahmed has cast his vote. Voting proceeds in Thinadhoo island calmly and utter serenity. Polling began in London, United Kingdom at 01:30 p.m. Maldives time. Two ballot boxes have been kept in Thinadhoo island's school out of which one is for residents and one is for residents from other islands. A total of seven ballot boxes have been stationed in the island, to which a majority of residents have already voted and continue to do so. As voting continues, the queues all over Male' city are seen growing larger. While polling is to end at 04:00 p.m. several stations still have huge queues stretching beyond eye sight. Many voters have expressed frustration over EC's procedures at the polling station in Malaysia as hundreds remain waiting in queue. Reports have surfaced that "fake" messages are being circulated via text in the name of high profile political leaders. Voting is ongoing in Addu City's Hithadhoo with 15 ballot boxes. A woman waiting in the queue for Ghaazee School's polling station has been taken to hospital after fainting. Many voters are waiting in long queues outside without shade. Home minister Azleen Ahmed talks to people at a polling station. Voters have expressed concern over having to wait in long queues for two to three hours. President Abdulla Yameen's current Vice President Abdulla Jihad has cast his vote. Several people have lined up outline Nooraanee School in Addu City's Hithadhoo district. While three ballot boxes have been stationed in Maradhoo district of Addu city, voting is proceeding. Complaints have risen over how poorly election procedures have been organized at the polling center in Kuala Lampur, Malaysia, where crowds of Maldivian residents have gathered to cast their votes. Polling queues are notably growing larger in several polling centers in Male' and Hulhumale. As such, voters are seen patiently waiting on sun-drenched streets outside Hulhumale' Gaazee School, as well as Rehendhi School. Transparency Maldives has stated that 99% of ballot boxes had been designed in ways that guarantee the validity of votes. Jailed former President Maumoon Abdul Gayoom has cast his vote in the ballot box stationed in the prison facility on Maafushi island, where he is being detained. There have been complaints that officials assigned to some ballot boxes are casting votes for people with special needs. Queue in Olhuvelifushi island of Lhaviyani atoll.notably growing larger as polling continues. It has been reported that polls have been delayed in Thinadhoo island of Gaaf Dhaalu atoll due to technical issues with tablet computers. As such, officials at polling stations are checking the voter's list and passing token numbers to voters. Polls have commenced after a short lapse in Vaikaradhoo island of Haa Dhaalu atoll. Polls had been halted for one of the ballot boxes due to slow internet access and inoperative tablet computers. RaajjeMV has received information that polls have been halted in one of the two ballot boxes stationed in Vaikaradhoo island of Haa Dhaalu atoll due to slow internet access and inoperative tablet computers. It has been over half and hour since polls have been halted for the ballot box. A total of 105 persons, 51 women and 48 men have cast their votes in Utheemu island of Haa Alifu atoll thus far. 87 women 57 men have cast their votes in Dhihdhoo island of the same atoll. A total of 116 persons have voted in Kolhufushi island of Meemu atoll and 87 persons have cast their votes inside one of the two ballot boxes stationed in Naifaru island of Lhaviyani atoll. 104 persons have voted in Hirilandhoo island of Thaa atoll. 101 persons have voted in one of the ballot boxes stationed in Kurendhoo island of Lhaviyani atoll. 150 person have voted in one of the ballot boxes stationed in Kurendhoo island of Lhaviyani atoll. 170 persons have voted in one of the ballot boxes stationed in Gaafaru island of Kaafu atoll. Women & Democracy have within hours after polling began across Maldives, taken to twitter about raising concerns of election issues that have surfaced already. As such they revealed that they had received information from Naifaru island that the number of ballot papers was not disclosed and that observers did not have the information when voting had begun. They also revealed that polling booths in some stations have been turned in angles that do not give access to monitors and observers to observe voter's movements. Having further revealed that some observers are unable to enter their designated polling stations because they have not been provided with passes, Women & Democracy stated that they have received complaints from Hiriya School that some serial numbers are missing in counter foils and serial numbers are not in order. Many polling stations have stopped use of tablets due to issues in the devices. Former First Daughter Dunya Maumoon has arrived at the Maldives Embassy in Colombo, Sri Lanka to cast her vote. Her sister, Yumna Maumoon and mother Nasreena Ibrahim have already cast their votes. While there are 2,788 eligible voters in Colombo, Sri Lanka, thus far, 67 residents have cast their votes inside ballot box number one with 66 residents having cast their votes inside ballot box number two. 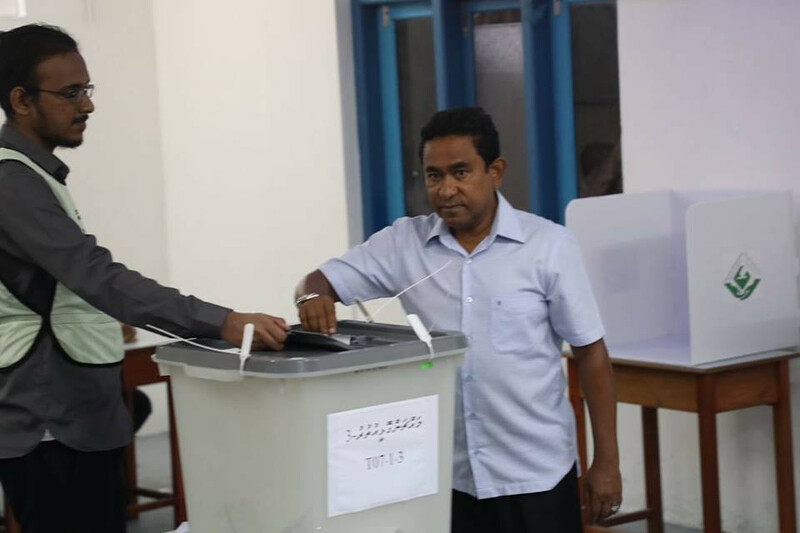 President Abdulla Yameen, the ruling party's candidate, casts his vote. Elections Commission member and spokesperson Ahmed Akram has revealed that although minor delays were experienced in commencing ballots, there is not a single island in which voting has not commenced since and that overall, voting is proceeding smoothly. Although they have been receiving some complaints, Akram revealed that they are being looked into. It has been revealed that voting ink disappear quickly from voters' fingers after casting their ballots. EC says that the ink disappears temporarily and will appear again. Former First Lady Nasreena Ibrahim, and her daughter Yumna Maumoon, have cast their votes. 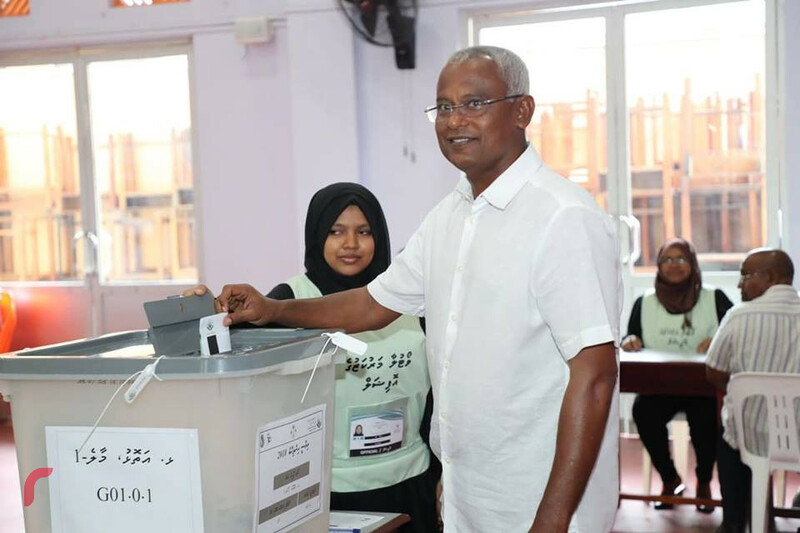 Opposition Presidential candidate Ibrahim Mohamed Solih has cast his vote. Polls are proceeding in Fiyoari island of Gaaf Dhaalu atoll. 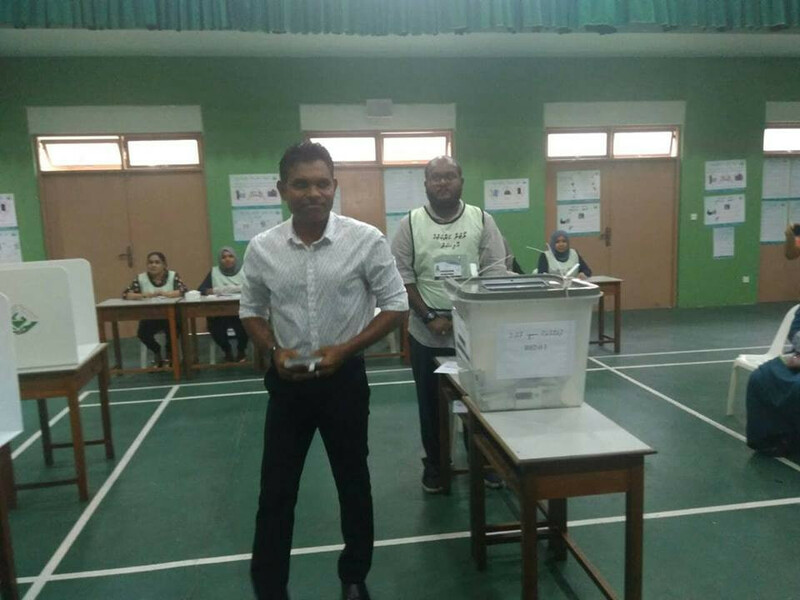 Joint Opposition's vice-presidential candidate Faisal Naseem has cast his vote. Former Auditor General Niyaz Ibrahim has arrived at the Maldives Embassy in Sri Lanka to cast his vote. Voters cast their ballots in HDh. Kumundhoo. Although polling was delayed due to a delay in preparations at Gaazee School in suburban Hulhumale, voting has since begun and crowd of voters waiting outside have begun lining up to cast their votes. Defense Minister Adam Shareef has cast his vote. Many voters queued in Imaduddin School. 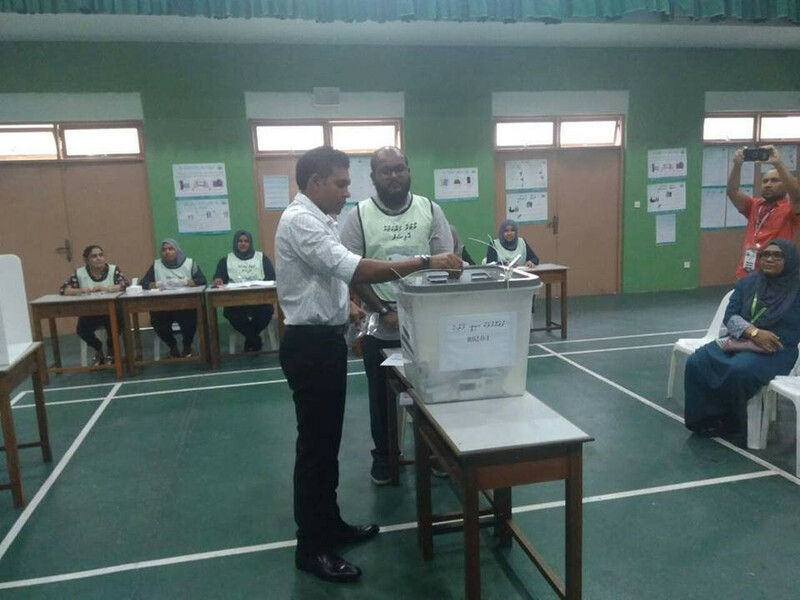 Maldives incumbent President Abdulla Yameen has cast his vote, although it was not aired on live Television, Spokesperson at the President's Office, Ibrahim Muaz Ali has confirmed via twitter. President Yameen cast his vote to the ballot box stationed in the Center for Higher Secondary Education (CHSE) building. 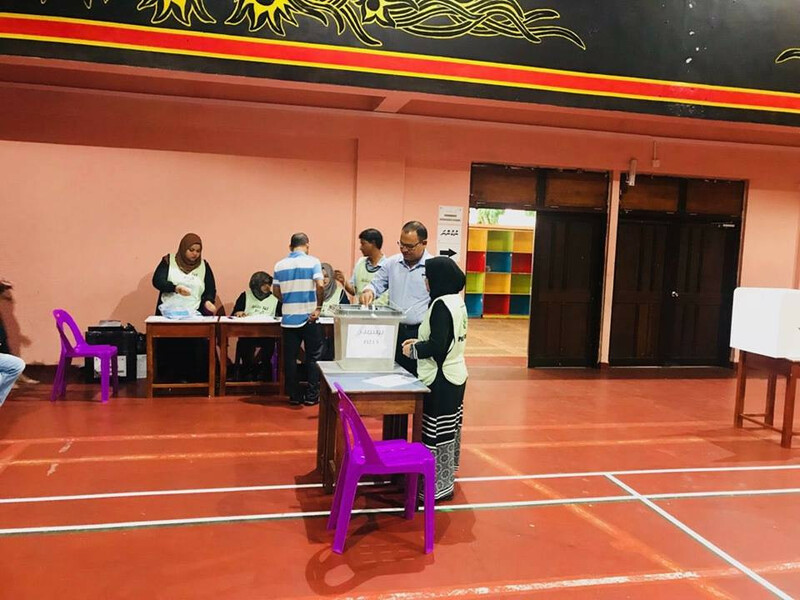 While 15 ballot boxes have been stationed in Addu City's Hithadhoo district, voting has begun and residents proceed casting their votes in all 15 locations. All ballot boxes are now open, there are currently no issues: EC spokesperson Akram. Presidential candidate number one, President Abdulla Yameen's running mate Dr. Shaheem has cast his vote. Although voting was delayed due to technical issues in preparations, voting has since commenced in Colombo, Sri Lanka and crowd of voters gathered outside Embassy have begun streaming in to cast their votes. RaajjeMV understands that there were technical issues with the electronic tablets used in the Embassy following which the commencement of polls was delayed. Voting begins in Velassaru Maldives resort. Voting has commenced in Ihavandhoo island of Haa Alif atoll and residents are casting votes inside two of the boxes stationed in the island. Large queue forms for Male' ballot box in Addu City. Former Minister Ilyas Ibrahim has arrived in Maldives Embassy in Colombo, Sri Lnaka to cast his vote. Although polling was delayed in Sri Lanka due to technical issues in preparations it has since commenced. Officials solved the issue in GDh. Thinadhoo and locals have begun casting their votes in some ballot boxes. RaajjeMV has received reports that ruling Progressive Party of the Maldives (PPM)'s vice-presidential candidate, religious scholar Dr. Mohamed Shaheem Ali Saeed is to arrive in Ghiyasuddin International School to cast his vote. Self-exiled former President Mohamed Nasheed's family has joined the queue in Iskandar School to cast their votes. RaajjeMV understands that Nasheed is not to cast his vote in this year's Presidential Election. Gaazee School has been opened for voters. Polling has begun in several resorts in which ballot boxes were stationed. As such, people have commences casting their votes in Royal Island Resort. Former First Lady Nasreena Ibrahim is to arrive shortly to cast her vote. Polling has begun in most parts of the nation. There have been reports of delays in some parts of the nation as well as abroad. As such, EC officials have reported that there is a delay in commencing polling in Sri Lanka, as well as Thinadhoo island. Delays in Thinadhoo surfaced as preparations are still underway. As such, the ballot boxes were to be opened at 07:30 a.m but there was a delay in that as well. Further, reports of issues with official's ID's have also surfaced. An official at the Elections Commission has revealed that there has been a delay in commencing polls in neighboring Sri Lanka. While polling was scheduled to begin in Sri Lanka at the same time as Maldives, citing EC officials, RaajjeMV's reporter in Colombo stated that the delay comes as preparations are still underway at the Maldives Embassy in Colombo. Voters have queued up outside Thaa atoll Kinbidhoo island's polling station with minutes left for polls to begin. Gaadhiffushi island's eligible voters also began queing up early Sunday morning. Queue grows longer in Rathafandhoo island of Gaaf Dhaalu atoll. Officials of the Elections Commission has arrived at polling stations across Male' to officially open the ballot boxes. Ballot boxes are scheduled to be opened at 07:30 a.m.
Maldives Meteorological Service has issued a white alert for the region between Between Haa Alif and Thaa atolls. Heavy rain and thunderstorms with gust winds of 40 mph expected in the region. Heavy rain and thunderstorms with gust winds of 40 mph expected. Area:Between Haa Alif & Thaa atoll. Period: 23/0330 hrs - 23/0930 hrs. ISSUED: 23/0310 hrs 23 Sep 2018. Several residents in Hithadhoo district of Addu City have queued up outside schools for ballots. The Maldives Broadcasting Commission on late Saturday publicized a statement threatening to penalize broadcasters that air content that deem "unproven". The statement by the commission reads that they have found some broadcasters to be airing content that has to do with presidential candidates and asks broadcasters to abide by the Anti-Defamation and Freedom of Speech Act, broadcasting laws as well as the commission's code of conduct. While final preparations for polling are underway across the nation, residents of Utheemu island have also begun lining up outisde the polling station. Final preparations for polling in resorts have begun as well. Velassaru Maldives prepares to begin polling. Officials are active in final preparations in Holiday Island Resort. Preparations underway in Baros Maldives as well. Final preparations for the polls are underway in Addu City. A total of 15 ballot boxes are to be stationed in Hithadhoo, Addu city. 39 ballots boxes will be placed for Addu City in total. Ballot boxes have been stationed in Nooraanee School, Sharafudheen School, Addu High School as well as Hithadhoo School. Final preparations are underway in several polling stations across the capital city. People have queud up outside Aminiyya and Iskandar Schools where constituents of Galolhu-ward at to cast their votes. People had begun queing up outside Thinadhoo school in the early hours of Sunday. 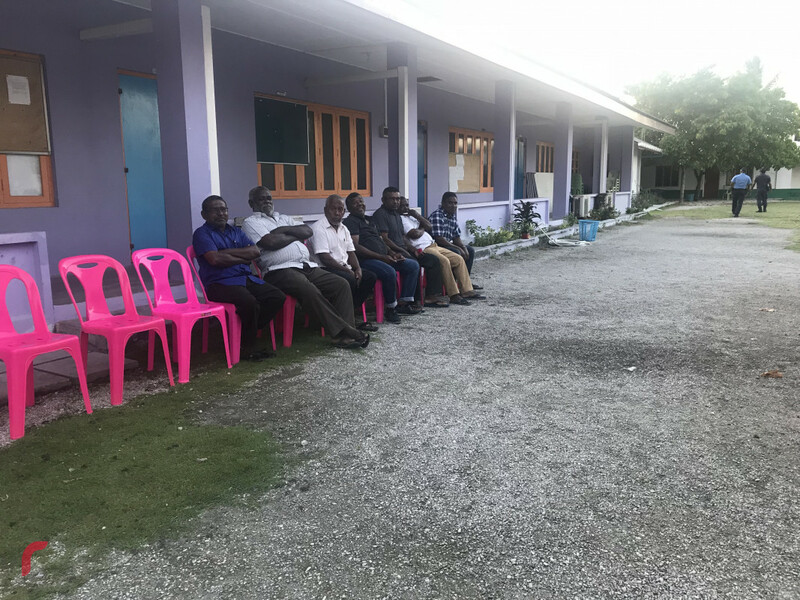 Residents in Maafushi island of Kaafu atoll have also begun queing up outside the polling station and the final preparations such as delivering relevant documents related to the polls before polling begins at 08:00 a.m. are underway. Two ballot boxes are to be stationed in the island, one in the prison facility and one in the Maafushi school. People have begun queing up outside Hinnavaru polling station. People begin queing up outside Gaazee School in capital city Male's suburban extension Hulhumale'. 9,187 eligible voters are to cast their votes in the suburban city with ballot boxes stationed in three locations, three in Gateway School, four in Gaazee School and four inRehendhi School. Women and men have been seperated into two queues since. Maldivian residents are to cast their votes into two ballot boxes stationed in Maldives Embassy in Sri Lanka, Colombo. 2,788 eligible voters are to cast their votes in Sri Lanka and people have begun gathering at the Embassy. Polling is to begin at 08:30 a.m. Sri Lanka time. A total of 10 ballot boxes have been stationed in Fuvahmulah City while two ballot boxes have been stationed for Fuvahmulah residents in the capital city Male'. People have queued up outside polling stations in the city. Fuvahmulah comprises of 7,426 eligible voters, with 5,726 in the city, and 1,700 in Male'. Several residents from outlying atolls began queuing up to cast their votes on Saturday night. While polling is to begin at 08:00 a,m, work has begun to deliver ballot boxes to the polling stations across capital city Male'. A total of 120 ballot boxes are to be stationed in the Greater Male' Area, suburban Hulhumale, Villimale as well as the capital city. RaajjeTV has begun it's live coverage of the election day to bring you the latest updates, information, and results of today's Presidential Election. Follow our live blog and tune into RaajjeTV to stay in the loop! The Elections Commission has begun sending ballot boxes to polling stations in capital city Malé and voters have begun queueing up outside. Polling will start at 8:00 AM. The Adhaalath Party has said that the text message, sent from the personal mobile number of party leader Sheikh Imran Abdulla's wife, is fake. The party said that a case over the matter has been filed with the police. In the message, which looks like a statement from Sheikh Imran, the party leader supposes to disalign himself with the coalition due to its presidential candidate reportedly having 'ties to jews'. The police raid on the opposition headquarters tonight, on the grounds that it is being used to distribute funds to be used for 'bribery', has resulted in officers finding no evidence or material relevant to their investigation. Robert Hilton, the chargé and interim chief of the US Embassy, says the police raid on the opposition's headquarters in capital city Malé calls into question the government's 'committment to free and fair elections'. With less that 10 hours before the Presidential Election is upon us, British Ambassador to the Maldives and neighboring Sri Lanka, James Dauris has taken to twitter, his concerns and hopes regarding Sunday polls. Dauris in his tweets wrote that it is understandable why so many are concerned about what "might happen on Election day". He further went on to share "the hope it will go ahead, be free and fair" as it would be "a sad day for Maldivians and to democracy if tomorrow's vote were to be delayed". In view of events in #Maldives today it's easy to understand why so many people are concerned about what might happen on Election Day. It would be a sad day for Maldivians and #democracy if tomorrow's vote were to be delayed. I share the hope it will go ahead, be free and fair. Officers, clad in uniform have raided joint opposition coalition's campaign headquarters with a court order, following an intelligence report that the officials in the HQ are involved in distributing bribes. RaajjeTV's "Dhivehinge Vote" translating to "Maldivians Vote" goes onair and joining us in tonight's program is Election's Commission member Ismail Habeeb Abdul Raheem to brief the public about the latest updates on the Presidential Election, scheduled to begin within less that 11 hours. While polling is scheduled to begin at 08:00 a.m. Sunday, voters have already begun queueing up to cast their votes and final preparations for the ballots are still ongoing in some islands, with Thinadhoo island's school all set for eligible voters to stream in and cast their votes first thing in the morning. 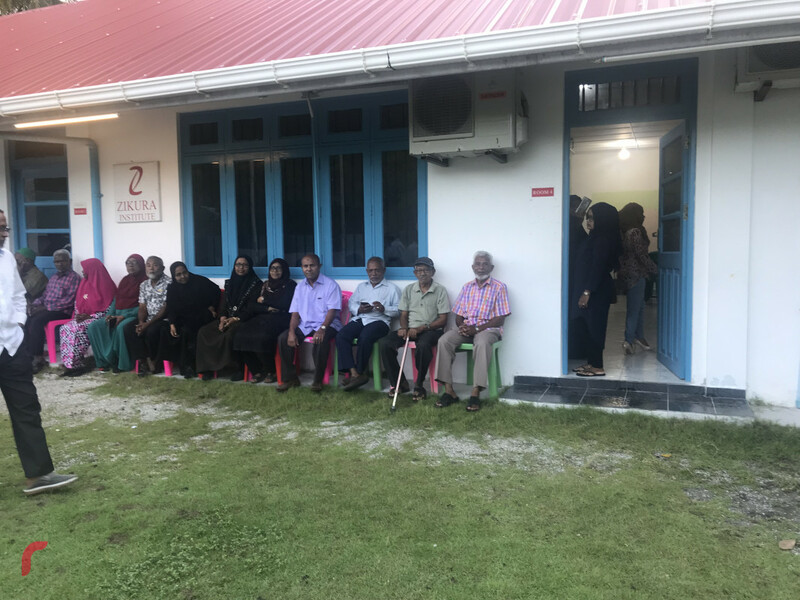 Residents of Hoadehdhoo island in Gaaf Dhaalu atoll have queued up outside polling stations and residents of several outlying atolls continue to do so. Supporters who took to the streets on Saturday evening in capital city Male' and outlying atolls, have concluded their final campaign activity before the Sunday election as 06:00 p.m is the timeout for all campaign activities. Before ending his speech at the finaly campaign gathering held before the Sunday election, Solih appealed on all citizens to "not give opportunity" to churn unrest within voters at polling stations, and to ensure the ballot procedure goes smoothly and peacefully. “Investigative departments have been politicized and their reputation has been soiled in front of the citizens. We are coming out against injustice, to free state institutions, to bring back justice to the nation. We are coming out to bring back the millions lost in state funds. We will establish a government that abides by the principles and morals of Islam. Our government will provide basic services to the citizens without discrimination between parties and we will enhance opportunities for students for higher education. Will involve youth in establishing policies. Opposition-led government will ensure women are respected and protected like they deserve. We will ensure civil service employees receive adequate wages and we will not sack any state employees from their posts unlawfully. We will give adequate power for island councils and transport between islands will be made more convenient” Ibrahim Mohamed Solih. “Every person who has uttered a word for justice has been tagged a criminal. Several innocent citizens have been jailed unlawfully, they are going through hell behind bars, they are being slain for standing up against tyranny, and the investigations have been halted” Ibrahim Mohamed Solih. “We do not want a man who support another man who aids priests, to lead the country. Why are the opposition members trying to buy votes of citizens? We do not need the word of priests to run the country. We no longer have leaders who care for the citizens” President Yameen. "The opposition is trying to buy votes and needs to be answerable in front of their creator when the day comes that they have to answer for their indecency. This is not how muslims must behave, this is not what Islam taught us. Islam will not be diminished in the country, we do not want another religion, So I ask you to step forth for your family members and vote for the righteous leader"
As 06:00 p.m. approaches, it is notable that supporters of candidate Solih have increased in amount and conitnue to parade down the streets of Male' city in unity. President Abdulla Yameen has joined the ruling party's final campaign event before the Sunday election, less than an hour before campaign activities are to conclude. Jailed former President Maumoon Abdul Gayoom's daughter, Yumna Maumoon takes to twitter hours before campaigns official end, states that the nation needs a leader driven by justice, humanity and kindness, someone who understands the citizen's wishes and needs. Yumna called on all to vote for candidate number two, Solih, in Sunday's election. As supporters of the joint opposition proceed with their final campaign activity, Solih, vying for Presidency as number two in the Sunday election, is spotted in the front-lines, "soaring" in excitement. Former representative of Dhiggaru constituency in Parliament and formerly close ally of President Abdulla Yameen, Ahmed Nazim has taken to tweet, posting a picture of himself with opposition coalition's Presidential candidate Solih, less than an hour before campaign activities are to conclude. Crowds of joint opposition coalition supporters parade down streets of Male' city before campaign events are to end at 06:00 p.m. Saturday. Watch the live coverage on RaajjeTV. Supporters of the ruling PPM continues their vehicle parade over Male' city as their final campaign activity before Sunday's ballots. Supporters of joint opposition coalition holds vehicle parade in Kulhudhuffushi island of Haa Dhaalu atoll to end presidential campaign before Sunday's polls. Supporters of the Joint opposiiton coalition begin parade in Thinadhoo island of Gaaf Dhaalu atoll to end opposition's campaign before Sunday's polls. Supporters of the opposition coalition on Saturday evening begun their final campaign for candidate Solih, by beginning a motorcycle ride over the island. Supporters of ruling Progressive Party of the Maldives have begun the ruling party's final campaign activity in capital city Male'. As such, President Abdulla Yameen's running mate Dr. Mohamed Shaheem Ali Saeed and members of PPM's Parliamentary Group are spotted participating in the motorcycle ride. Joint opposition supporters pour onto the streets of capital city Male', as their final campaign before all campaign activities are to end at 06:00 p.m. today. Presidential candidate Ibrahim Mohamed Solih and his running mate Faisal Naseem join the parade which began on Saturday evening. On Sunday morning, Maldivians will go to the polls for the presidential elections. With 262,135 eligible voters, 472 ballot boxes are to be placed across the country and abroad- two in Sri Lanka and one each in India, Malaysia and the United Kingdom. There are two individuals running in the 2018 presidential election; incumbent President Abdulla Yameen and Joint Opposition’s Ibrahim Mohamed Solih. While the provisional results are expected to come on Sunday itself, final results are to be announced a week later, on September 30th. Political parties will not be allowed to conduct campaign activities from 06:00 p.m Saturday.